June | 2014 | Agile KM for me… and you? 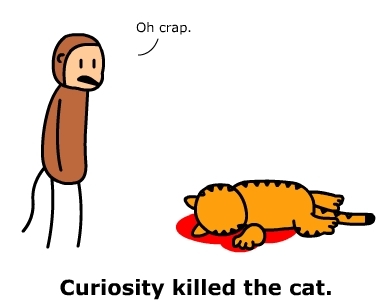 When I was a child, one of the sayings that finger-wagging adults liked to throw at me and fellow little people was that ‘la curiosité est un vilain défaut’ – Curiosity killed the cat. How much we have moved on from that age when staying where we are was the desired end state. A neverending never changing state. Now the only thing that never changes is change itself, though even that is not true because the pace of change is increasing – and so is our need to connect to others, with curiosity, and a little something else, of great importance. As modern knowledge workers, we have to connect the dots, we have to find others, build trust with them, and do ‘stuff’ together. If ‘In complex initiatives, expert predictions of outcomes are barely better than flipping a coin‘, we must harness collective intelligence. And that will not happen with alpha male chest-beating behaviour but with humility, the other godmother of learning (remember the happy families of engagement?) next to curiosity. Being humble doesn’t mean we don’t know where we’re headed and think everyone else does stuff better than us or better stuff than us; it just means that we recognise we are trying to do something (or some things) without full certainty, and are open enough to hear what others do in relation, and occasionally pick up useful elements from their approach. The path to wisdom is paved with effectiveness, focus, humility and empathy and just so we learn by being intently open to any signal that may improve our own understanding and thought-processing, set of practices and attitude. Any opportunity is good to power up another segment of the collective brain grid, the common energy grid of intent, purpose and calling (something I’ve written about before). We can keep our criticism about, we should question our education and educate our questions but this is no longer the time to be cocky, know-it-all and ‘go it alone’. We need specialists in this complex world, but only combined with other talents. Want some spicy questions, Nadia? How come leadership still seems overwhelmingly attracted to alpha-male, know-it-all styles? Is humility enough to be a good modern knowledge worker? What other traits of personality allow us to be agile, ever-learning, increasingly effective? If humility was considered to be assessed (or even measured) in an organisation – for broad effectiveness – how would we do so to qualify it? I’ve been following some LinkedIn groups (particularly the ‘Professional facilitators network‘ – mind that this link requires login) on facilitation with excellent insights. This is some incentive for me to actually blog more about facilitation… and perhaps even start a blog on facilitation as it’s a slightly different topic than strictly agile KM and learning (even though the two are interlinked for their focus on learning and collective action). Another interesting idea came my way this week, prompted by my colleague Peter Ballantyne: the walkshops – an idea that the UK’s Institute for Development Studies has piloted and reflected upon. This is something to try out, and I think I just might in what could possibly become the third workshop focused on CGIAR communication and management for CGIAR research programs (or kmc4CRP ;)). Actually last week for an ILRI Comms meeting we had a walking session and it was a hit. Perhaps most importantly, me and a group of fellow KM4Devers are thinking about focusing on facilitation, for the issue 11.1 (May 2015) of the Knowledge Management for Development Journal. We are still debating the exact focus, as we’re rather struggling with too many ideas than too few. Our initial thoughts are available here. 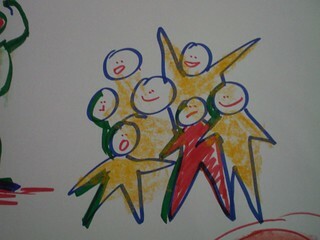 I personally hope we will cover blended facilitation (online/offline), moving away from events to fold into longer engagement and learning processes, modern uses of technology (using phones, clothes and other smart devices) to get groups to evolve, the distribution of facilitation and developing an empowering leadership culture as well as how capacity development comes into the picture. At last, I don’t despair finding time to come up with my own facilitation approaches – notably mimicking patterns found in nature and among animals. Wild, eh? Amidst all of this, I actually have a lot of events to facilitate in the coming months so time to kick myself out of comfort zone and to try daring new ideas and approaches. Wish me luck in changing myself, it’s never a given 😉 !